Catalan student Laia Campos Estremera is ending her Cambridge English studies on a high, fulfilling a life long dream to swim with seals. Laia with 5-year-old Nelson at Underwater World. I interviewed Laia about her experience. How did you learn about Underwater World? A classmate told me about it. It is on the Sunshine Coast so is near and not as expensive as Sea World. Why were you interested in visiting Underwater World? It was because I wanted to have an experience with animals before I left. I really wanted to feed dolphins but this was impossible and then my classmate told me about swimming with the Seals. We can’t do this in Spain. You can also swim with sharks, but I preferred seals. How did you organise this? Carolina at Backpackers World Travel organised this for me. They are attached to the school so it was easy. Was it as good as you expected? It was the best experience in Australia for me. When you do these kinds of activities you come back and your self-esteem is higher. I am a teacher, when I go back to Spain, I will find out about a Master Studies in education therapy with animals. My whole experience of coming to Australia and learning English has given me strength and confidence. I feel I can return and be able to do anything I put my mind to. The photo is wonderful. Yes, the five-year old seal is called Nelson. 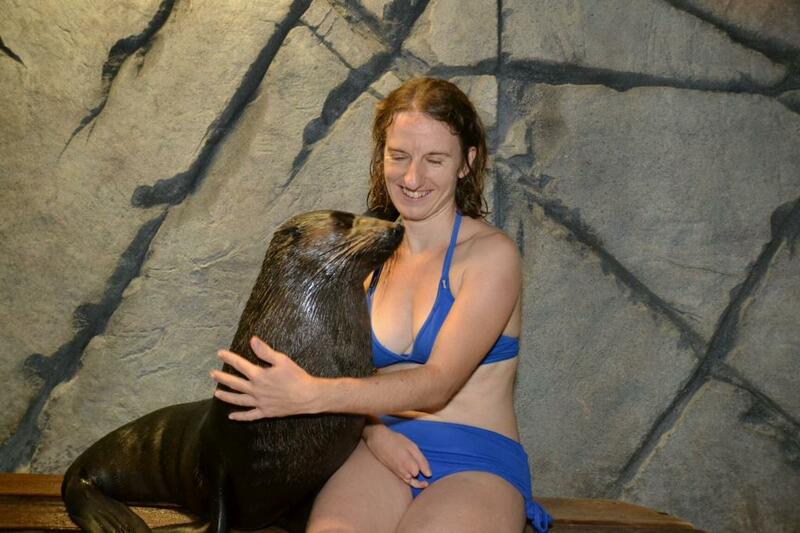 After I finished swimming with all the seals he just came up to me and was very affectionate. I can’t describe in words how wonderful it was. I recommend this activity to everyone before leaving. This entry was posted in Uncategorized and tagged activities by Lexis | Noosa. Bookmark the permalink.